Farrell Auctioneers & Estate Agents Ltd. bring to the market this spacious four bedroom detached home, extending to an imposing 1,302 sq. ft., in the highly sought area development of Gort Na Ri. Accommodation is offered as follows: entrance hall, a large family lounge with timber flooring, open fire and feature fireplace. The kitchen & dining area - ample kitchen units are built in with all modern conveniences. Adjacent to the kitchen is the utility which has tiled flooring and is plumbed for a washing machine and dryer. There are four bedrooms at 1st floor level - three doubles & one singles - all double rooms have built in wardrobes & solid pine flooring. The master is en-suite with shower is tiled floor to ceiling. The main family bathroom, which is also tiled floor to ceiling, contains w.c, w.h.b, bath and overhead electric shower. 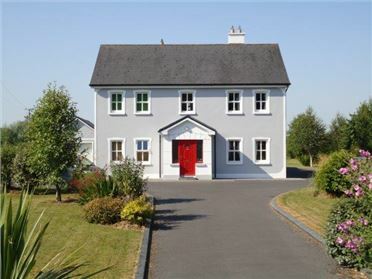 Gort Na Ri is one of the most sought after estates in the area - it is predominantly owner occupied by young families, given its location & proximity to local swimming pool, & GAA grounds, good schools etc. In fact there is walkway which is a short cut to Gort town centre from the estate. Access to the town and motorway is direct through easy and quick access to the bypass. Farrell Auctioneers & Estate Agents bring “An Culileann” to the market; this property is a fantastic detached family home in a popular location close to both Kilcolgan and Clarinbridge villages with easy access to Galway City and the M6/M18 motorways. Set on beautiful mature landscaped site circa 0.50 acre (0.22HA. ), the property is well serviced with fibre broadband and local schools bus service passing the door. The accommodation comprises entrance hall, a reception room, dining room, kitchen/living, guest w.c on the ground floor. There are four double bedrooms, two of which is on the ground floor and a shower room on the first floor. The property benefits from a detached garage with loft area to the rear with excellent work and storage space. Externally the gardens are landscaped with stone wall boundaries, electric gates and tarmac drive. There are mature lawns to the front, side and rear of the property with mature trees hedges and plants throughout the garden. A lovely decking area takes full advantage of the south west facing aspect of the rear garden. Clarinbridge and Kilcolgan villages are about 3 km away with local schools shops and services. 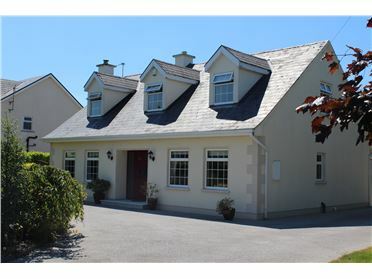 The M18 is accessible within 9 km, and Oranmore, Kinvara and Galway City Centre are all easily accessible from this lovely home. 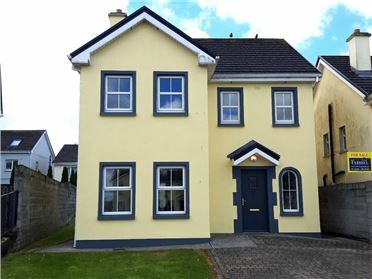 Farrell Auctioneers Valuers & Estate Agents LTD are delighted to offer to the market this stunning, dormer style family home on the Athenry Road of Loughrea, Co. Galway for sale by private treaty. Located directly across the road from the Loughrea Hotel & Spa and within a few hundred metres of two large supermarkets, this property is situated only a short walk from the town centre and all its amenities. Sitting on a beautifully landscaped site with a tarmacadam driveway and a large detached garage, this property boasts attention to detail and is finished to an extremely high standard both internally and externally.The property consists of a bright and spacious entrance hallway with tiles to the floor, a cosy living room with a stove set in a beautiful stone surround feature which goes floor to ceiling and also includes solid timber floors and double doors that lead out to the kitchen dining area. There is another large family room with an oil stove set in to a beautiful black marble fireplace again finished with solid wood floors and door. The, kitchen/dining area has ceramic tiles to the floor and white fitted kitchen units with integrated appliances and a utility room finished in uniform fashion with the kitchen. There is a separate large office /study / playroom area and a downstairs double bedroom with en-suite and with carpet to the floor. There is also a fully tiled downstairs bathroom. First floor accommodation comprises of a carpeted landing area, 3 bedrooms, 2 spacious double rooms –one with built in wardrobes and drawers and both en-suite with floor to ceiling tiles. The large master bedroom has floor to ceiling fitted wardrobes, carpet to the floor and is en-suite also. The family bathroom is tiled floor to ceiling and comprises of a bath / jacuzzi, w/c and hand basin. The property has hollow core flooring and is heated by Geo thermal underfloor heating to both the ground and first floor. This really does tick all the right boxes for someone looking for their lifetime home in prime urban location. We highly recommend viewing the property to appreciate it in full, to make an appointment please contact 091 – 632688 or 086 – 2455925. 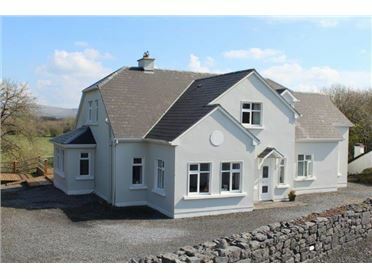 Farrell Auctioneers, Valuers & Estate Agents Ltd are delighted to offer to the market this beautiful property finished to a high standard in Carnanthomas, Craughwell, Co. Galway. 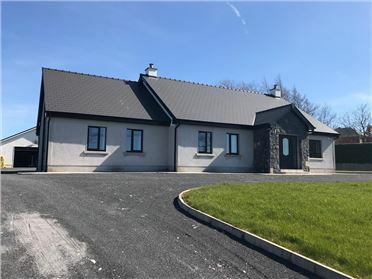 The property is presented in very good decorative order throughout the property offers a family home in good location close to Craughwell and Loughrea. Accommodation extends to approx. 2,230 sq.ft. and comprises of entrance hall, sitting room, kitchen/dining/living area, bathroom, utility, and four bedrooms two of which are en-suite. The property also hosts many addition features such a detached garage with roller door, heat recovery system, fully alarmed, water treatment softener in place, integrated Hoover system to name but a few. Ballymanagh church and primary school is close vicinity and there is easy access to Craughwell Village and all local amenities. Loughrea town centre, Galway City and the M6 Galway/Dublin Motorway are all within short driving distance. Viewing of this property is highly advised, for more information or to arrange a viewing please contact the office on 091 – 632688. Farrell Auctioneers Valuers & Estate Agents LTD bring to the market this two bedroom cottage and farm buildings on approx. 52 Acres at Scalp, Peterswell, Co. Galway and commonage shares in adjoining mountain of approx. 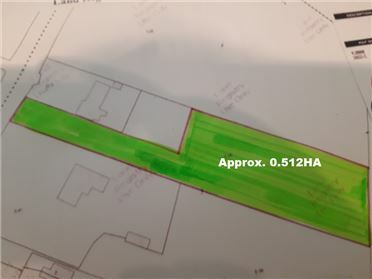 36 acres all of which are contained in Folio GY27361F, GY44023, GY49105F & GY7785. 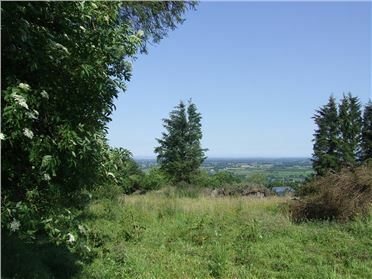 The property is set on the side of the Slieve Aughty mountains and overlooking Galway Bay, parts of May and the Clare hills. The property itself is set in the most private setting off a cul de sac private road and is in need of repair but offers huge potential for those looking to refurbish a property in the countryside. The lands are of average to poor quality and only suitable for summer grazing. This property offers huge potential in an amazing picturesque setting with panoramic views. 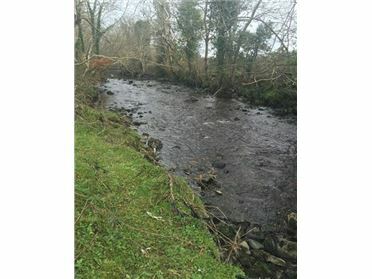 The property is nestled between Gort and Loughrea and is just a short commuting distance from both which offer all amenities needed for everyday living. Farrell Auctioneers & Estate Agents LTD bring to the market this substantial detached family residence in excellent condition sitting on a considerable sized site. Prospect, Gort offers an excellent opportunity for a purchaser to acquire a magnificent home in an idyllic setting. The property which spreads over three stories, offers approximately 2,136 sq.ft. of ample living & sleeping quarters throughout. The property has been maintained & enhanced over the years to impeccable standards by the owner which is evident throughout. Quality features included are, but not limited to, hollowcore flooring, three way water heating system, private well, five bedrooms one of which is on the ground floor, mature organic orchard detached garages to name but a few. The downstairs accommodation comprises of a large welcoming hall, sitting room, ground floor bedroom, kitchen with bespoke fitted units, utility, sun room, painting studio, and a bathroom. The second floor comprises of four additional sizable bedrooms, the master which has a walk in wardrobe and en-suite and bathroom. The third floor which is fully converted attic spaces offer two carpeted areas both with Velux windows. Externally, the property benefits from an abundance of space with approximately 3 acres available. This area is arranged between a beautifully manicured green lawn, tarmac driveway, large double garage with loft storage which has power and water supply, an additional generous sized tractor shed and a storage lean to, raised vegetable fruit beds. Prospect location avails of attractive green surroundings and is ideally situated only a short distance to Gort town centre (1 mile) whilst the property has direct access to Galway City (35km) by the M18 Motorway, offering plenty of amenities & services within easy reach. 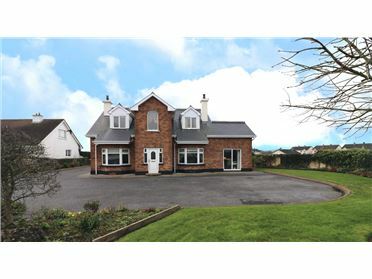 Additionally, the local primary schools and secondary school are walking distance, Prospect offers the perfect opportunity for a purchaser to obtain a first-rate family home with an abundance of space, internally & externally, with picturesque surroundings whilst still being able to avail of all required conveniences & luxuries. Farrell Auctioneers & Estate Agents Ltd. bring to the market this near 4 acre plot with FPP for a 250 sq.m home, design to be eco-friendly and energy efficient, together with large detached garage. This is to be a split level home, over 3 levels showing an almost traditional cottage style home to the road but from the rear will be a contemporary 3 level residence set elevated out overlooking hinterland at the Boleyneendorrish River of which the property as over 150 metres of frontage too. This is a quiet rural setting, 1 mile from Peterswell village with Church, Pub and Community Centre and a further half mile or so to Local National School. The plans submitted are for a spacious bright home offering superb privacy and outdoor family area to the rear overlooking, and listening, to the river. Farrell Auctioneers are delighted to bring to the market this 4-bedroom detached dwelling. The property set on a landscaped site extending to approx. 0.22ha is tastefully decorated throughout and is turnkey condition. Accommodation in this property extends to approx. 1,755 sq.ft. and includes entrance hallway, sitting room, kitchen/dining area, utility, conservatory, w.c, 4 bedrooms (1 en-suite) and bathroom. 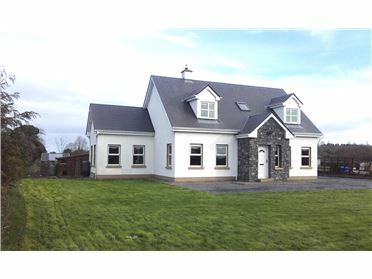 The property would make an ideal family home with national schools located close by and the property is on the secondary school bus route, and is just 11km from all the amenities Gort has to offer including access to the M18 Limerick/Tuam motorway which is ideal for commuting. This property has to be viewed to be appreciated.